- Date: 09/2013, Seed: $1.25 M (post valuation: undisclosed amount). Temnos generates revenue on a volume-based, subscription model. Customers subscribe to one of several packages (based on how rich the metadata or metacontent is that they want to receive) and then pay for any additional document processing volume beyond what is included in a particular package. Rev-share agreements are also available as an alternative to the default document-volume pricing model. There are some competitors who offer point-solutions to some of what Temnos does, such as OpenCalais for tagging, Peer39 for classification, etc. But our platform does all that and more via API’s that are far more rich and flexible to enable developers to customize outputs to their needs. 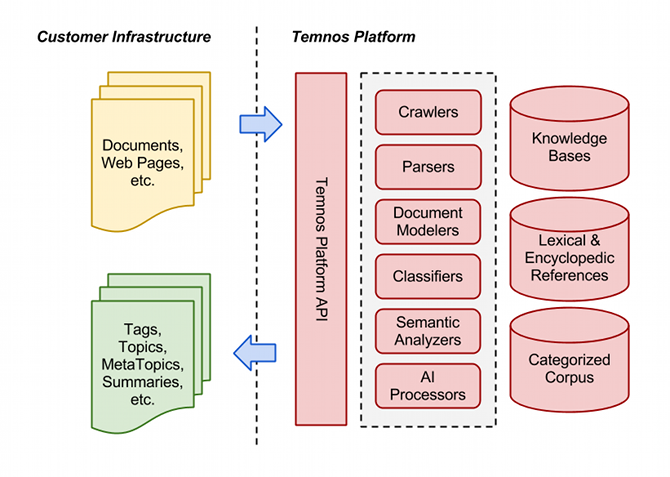 Temnos is the one-stop solution for every sort of page-level metadata and metacontent you could wish to extract or generate from your text collection to optimize its value in today's highly-competitive media marketplace. The technology has been field-proven by major technology, industry and media companies including CNET, About.com, IDG, General Motors, Federated Media, Disqus, Metaweb, and more. Temnos was featured in a VatorNews article: "Splash SF Oct 2013 Finalist - Temnos"
Temnos was featured in a VatorNews article: "Here are your 10 finalists for Vator Splash SF!" Jim Bailey confirmed Temnos as an investment. Temnos was featured in a VatorNews article: "Funding Roundup - week ending 9/13/13"
Temnos was featured in a VatorNews article: "Temnos comes out of stealth with $1.25M in seed funding"